An article on the Joshua Kennon financial blog made me rethink my entire financial approach, and for the better. He argues that is it better to purchase higher quality items and have them last longer than to always purchase the lowest cost item. 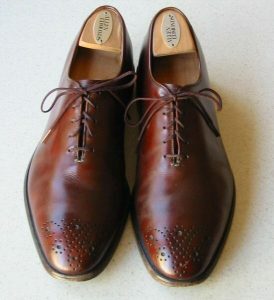 He used the example of Allen Edmond dress shoes for those of us slogging about the office and noted that Michael Bloomberg has had the same pair of dress shoes for 25 years. There are two concepts behind it that work together. The first concept is high enough quality to be repaired. The second concept is cost per use. I had first noticed the cost per use factor when I purchased high quality wood furniture years ago (on sale of course) when I moved in college. A few years in, the draw pull broke off the desk. Previously, with my half glue, half sawdust furniture, that would be it. Eventually the whole thing would get moisture in it and then crumble requiring a new outlay of cash, gas, time and energy to replace it and send the old one to the landfill. This desk seemed, well, stable. And there appeared to be a real nail there still sticking out! Bravely, I grabbed a hammer and 30 seconds later it was fixed. This was quite pleasing to me and I recorded two points on my man card. This sequence with the furniture has been repeated many times and it still looks great 20 years later. I would have easily have gone through 3 sets of replacement furniture during that time frame – all of it lower quality and ended up spending more money over time. My cost per use is now just a few pennies and dropping each day. So I diligently checked my expenses for the last few years on that shoe question. Couldn’t be much right? My lower cost shoes treads wore out often making them dangerous in wet weather and junky looking. I was stunned to see an annual outlay of $200 for a set of shoes (a black pair and a brown pair). Over ten years I had dropped $2000 on work shoes alone. What? And attempts to re-sole them as part of us trying to pay for private school (cut all the expenses was our mantra!) failed as the fine cobbler declared them to be too low quality to repair. Compare this to the Allen Edmonds which uses what they call Goodyear welting that enables them to repair and restore shoes repeatedly. Indeed, they offer a repair service and have a fancy name for it: recrafting. As an extra bonus they are made right here in the USA so I am supporting local companies. This in turn results in a longer life for the shoe. You end up wearing a higher quality shoe that costs less per wear over time. Indeed, my fancy shoes have already lasted longer than my previous set would and, at this point, have paid for themselves. Change your mindset from cheapest item on sale to cost per use. As a delightful side effect you will send less stuff to the land fill (your an environmentalist now!) and spend a lot less time replacing your stuff. I normally don’t approve advertising cross links comments but this one was a hoot. Or perhaps it was too excellent? Great point! Thank you for highlighting that aspect of it – you are so right on the not having to worry benefit. I didn’t realize that I had one less thing to worry about until after a few months (when normally I would be checking my cheapo shoes to see if they had already lost the treads) – that alone is worth it. Hey there- I saw your blog on the Rockstar finance forum and came to check it out. I will definitely be checking back regularly for some tips, there is a huge chance my husband and I are going to go the private school route for our kids, and it will be tough. Thanks for making a blog on this topic! Thanks – I appreciate the nice comment! It is a difficult decision and I wish you the best on the considering the options (but I hope you do it). Feel free to message me on Rockstar finance if you have any questions on the process when you get to that point – we have been paying for private school for ten years now so we have lots of lessons learned we are happy to share. There is an entire subreddit dedicated to this topic. Visit /r/BIFL (Buy It For Life). They have recommendations for long lasting versions of nearly everything. Mrs BITA – great tip – thanks for this information!